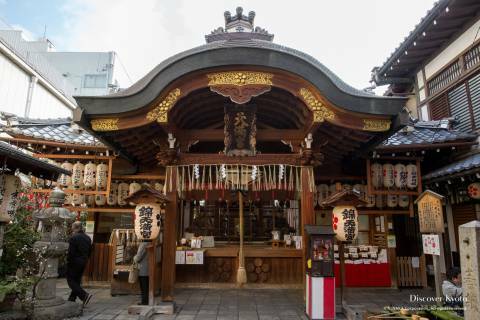 At the eastern end of everyone’s favorite Nishiki Market stands Nishiki Tenmangū, a Shinto shrine dedicated to the deity Tenjin. Despite its small size, Nishiki Tenmangū sees a lot of foot traffic from the many people who come to sample the local cuisine and shopping in Nishiki Market, and it is considered one of the preeminent Tenjin shrines. Easily spotted by the many softly glowing lanterns hung at the entrance, Nishiki Tenmangū's cozy grounds contain a natural spring, some nostalgic fortune-telling, a statue of Tenjin’s divine messenger, and a sanctuary dedicated to Tenjin himself. 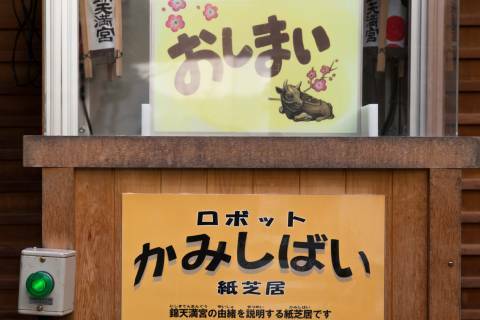 Nishiki Tenmangū is home to a rather interesting form of mechanical fortune-telling. As a shrine dedicated to Tenjin, the kami now famous as the god of scholarship, Nishiki Tenmangū is home to many features shared by Tenjin shrines. This includes not only plum trees and a propensity to see many students praying around exam season, but also the stone cows said to represent the divine messengers of the deity. Pet this nade-ushi cow in the hopes of improving your luck, and if you’d like, pet it according to your wish, such as petting its belly for a safe pregnancy, its head for headache prevention, etc. Nishiki Tenmangū is home to a natural spring that flows up from over 30 meters below ground. This “Nishiki no Mizu” is certified safe to drink, (and tested yearly), and it’s not uncommon to see locals bottling it to take home. Untainted by bacteria, smell, or unpleasant flavor, this spring water rises up at approximately 17-18 degrees Celsius (62-65 Fahrenheit) and is considered one of the famous water sources from the old capital. It is said that in life Sugawara no Michizane adored the Japanese plum tree, and most shrines dedicated to him will boast at least a few of the lovely winter-flowering plants. 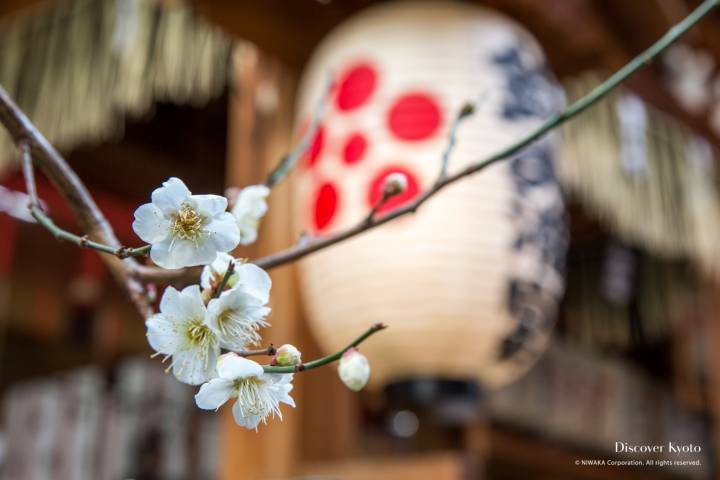 At Nishiki Tenmangū you can make a wish by purchasing a Daigan Ume (Plum of Great Wishes) for ¥500. 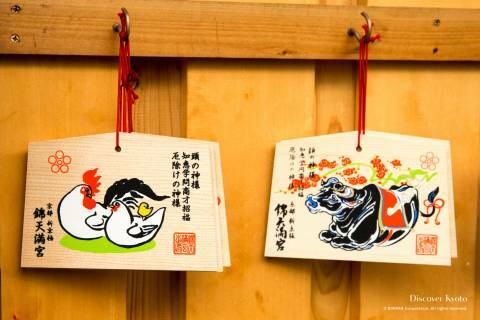 Decorated with the seal of the shrine, the plum-shaped wooden box hangs from a crimson cord, and is meant to hold a special strip of paper on which you write a wish that you must be careful not to let anyone see. Once your wish is enclosed in the Daigan Ume, either carry it with you or hang it on a tree at the shrine in the hope it will ripen and come to fruition just like the real plums. 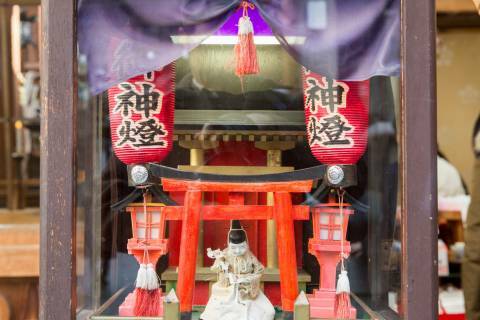 Nishiki Tenmangū is home to a rather interesting form of fortune telling in the form of the Karakuri Omikuji. In glass cases, robotic shishi lions wait to be fed coins that will bring them to life, dancing to traditional gagaku court music as they move to fetch a paper fortune and drop it into the tray for you. Karakuri ningyō were mechanized puppets popular in the Edo period, and these Karakuri Omikuji use modern robotics to illustrate the movement of the karakuri of the past. These traditional-looking robots are made even more charming by the fact that they were actually designed by the shrine’s Head Priest, Mr. Yamato, and only ten exist. While you’re on the precincts, why not give the Karakuri Omikuji 200 yen and watch the shishi inside fetch your fortune for you? They even offer two types of English fortunes! Nishiki Tenmangū was founded in 1003, but it was originally located at Sugawara-in, the birthplace of Sugawara no Michizane, the mortal man who was deified as the kami Tenjin. (See more on this story here.) After Sugawara no Michizane’s death, the Sugawara-in was renamed Kanki-ji (Temple of Great Joy) and moved to Rokujō Kawara-in, the former villa of Minamoto no Tōru (822 –895), a son of Emperor Saga said to possibly be the model for the Tale of Genji’s eponymous hero. After three hundred years the grounds were given over to the Yahata Zendō-ji Jishū sect Buddhist temple for a training hall and renamed to Kankikō-ji, while the shrine served as a chinju-sha, shrines used to worship the tutelary deity that protects the temple precincts. During the Momoyama period (1583 – 1600), warlord and de factor leader of Japan Toyotomi Hideyoshi implemented a large-scale renovation of Kyoto according to certain urban planning ideas, aligning streets in a grid and shuffling the location of key shrines and temples. During this rebuilding the shrine was moved to one of the temple’s training dōjō on Shijō street. In 1872, the forced separation of Buddhist and Shinto religious sites made Tenmangū independent from the temple, which was moved to the east. In this manner, 400 years after it moved to its current location, it was consecrated under the name Nishiki Tenmangū.